My first painting of 2010, and maybe the most detailed one I've ever done. My goal for this year is to focus less on quantity, and more on detail, something which a lot of my previous paintings lacked. I don't know what it is about sheep that's a bit frightening, maybe it's that their eyes have a slightly dead look about them? And maybe it's just me. 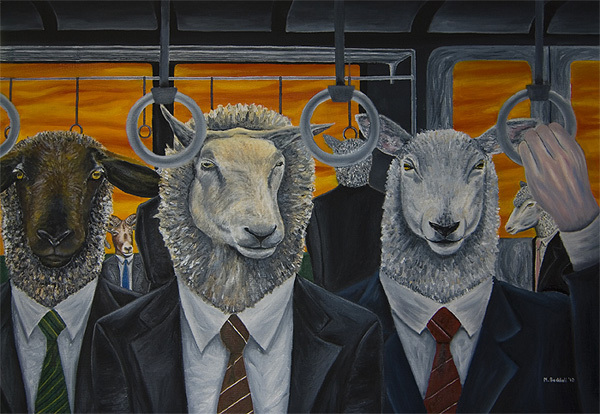 Gotta love 'em though, this is my second painting using sheep, and I wanted to use them again in an even more surrealistic way, something slightly disturbing yet also kind of comical.